For years, the researchers at HZB have been working intensively on upgrading the electron storage ring into a variable pulse length storage ring (BESSY VSR). Now things are becoming concrete: On 30 July BESSY II is switched off for ten weeks. Then the first modifications in the experiment hall are due to be carried out in order to realize BESSY VSR. “We have four or five very tough but also very exciting years ahead of us,” project manager Andreas Jankowiak said upon BESSY VSR’s approval in June 2017. With these words, he hinted at the mountain of work the various teams at HZB are now facing. 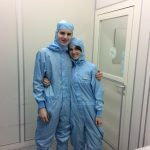 It’s not just the scientists who are entering uncharted territory, it’s everyone: technicians, engineers, builders and radiation protection experts alike are tasked with developing novel solutions in the realisation of BESSY VSR. It all starts in just now. On the 30th of July, BESSY II will be shut down for ten weeks. During this shutdown, the team will tackle the first tasks. The schedule is a tight one. Right on top of the list is the dismantling of the multipole wavelength shifter, the EDDI beamline and the radiation protection hutch. “We need this space to construct the cold supply for the superconducting cavities in the storage ring,” explains Ingo Müller, who is coordinating the shutdown process hand-in-hand with Christian Jung. And there are yet more projects to be done during the summer shutdown, Jung explains. 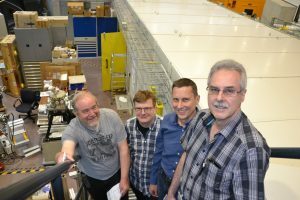 The colleagues from the Institute for Accelerator Physics are constructing a diagnostics beamline for BESSY VSR in the vicinity of the EMIL hutch. Furthermore, a laboratory for electrochemical experiments on solid-liquid boundary interfaces (BEIChem) will be built at BESSY II and will need access to the X-ray light. “Reconciling all these subprojects takes precise planning and logistics. And once the shutdown is over on the 26th of October, and the first users are waiting at the door, then everything has to run just like it did before,” Christian Jung says.